Apollonius of Perga (Greek: Ἀπολλώνιος; Latin: Apollonius Pergaeus; c. 262 – c. 190 BC) was a Greek geometer and astronomer noted for his writings on conic sections. His innovative methodology and terminology, especially in the field of conics, influenced many later scholars including Ptolemy, Francesco Maurolico, Johannes Kepler, Isaac Newton, and René Descartes. Apollonius gave the ellipse, the parabola, and the hyperbola their modern names. The hypothesis of eccentric orbits, or equivalently, deferent and epicycles, to explain the apparent motion of the planets and the varying speed of the Moon, is also attributed to him. Ptolemy describes Apollonius' theorem in the Almagest XII.1. Apollonius also researched the lunar history, for which he is said to have been called Epsilon (ε). The crater Apollonius on the Moon is named in his honor. He is one of the ancient geometers. Parabola connection with areas of a square and a rectangle, that inspired Apollonius of Perga to give the parabola its current name. The degree of originality of the Conics (Κωνικά) can best be judged from Apollonius's own prefaces. Books i–iv he describes as an "elementary introduction" containing essential principles, while the other books are specialized investigations in particular directions. He then claims that, in Books i–iv, he only works out the generation of the curves and their fundamental properties presented in Book i more fully and generally than did earlier treatises, and that a number of theorems in Book iii and the greater part of Book iv are new. Allusions to predecessor's works, such as Euclid's four Books on Conics, show a debt not only to Euclid but also to Conon and Nicoteles. He defines the fundamental conic property as the equivalent of the Cartesian equation applied to oblique axes—i.e., axes consisting of a diameter and the tangent at its extremity—that are obtained by cutting an oblique circular cone. The way the cone is cut does not matter. He shows that the oblique axes are only a particular case after demonstrating that the basic conic property can be expressed in the same form with reference to any new diameter and the tangent at its extremity. It is the form of the fundamental property (expressed in terms of the "application of areas") that leads him to give these curves their names: parabola, ellipse, and hyperbola. Thus Books v–vii are clearly original. In Book v, Apollonius treats normals as minimum and maximum straight lines drawn from given points to the curve (independently of tangent properties); discusses how many normals can be drawn from particular points; finds their feet by construction; and gives propositions that both determine the center of curvature at any point and lead at once to the Cartesian equation of the evolute of any conic. Apollonius in the Conics further developed a method that is so similar to analytic geometry that his work is sometimes thought to have anticipated the work of Descartes by some 1800 years. His application of reference lines, a diameter and a tangent, is essentially no different than our modern use of a coordinate frame, where the distances measured along the diameter from the point of tangency are the abscissas, and the segments parallel to the tangent and intercepted between the axis and the curve are the ordinates. He further developed relations between the abscissas and the corresponding ordinates that are equivalent to rhetorical equations of curves. However, although Apollonius came close to developing analytic geometry, he did not manage to do so since he did not take into account negative magnitudes and in every case the coordinate system was superimposed upon a given curve a posteriori instead of a priori. That is, equations were determined by curves, but curves were not determined by equations. Coordinates, variables, and equations were subsidiary notions applied to a specific geometric situation. 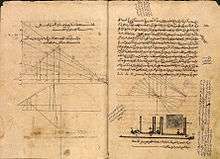 Each of these was divided into two books, and—with the Data, the Porisms, and Surface-Loci of Euclid and the Conics of Apollonius—were, according to Pappus, included in the body of the ancient analysis. Apollonii Pergaei Conicorum libri quatuor, ex versione Frederici Commandini (Bononiae, 1566), fol. The Arabic translation of the Books V–VII was first published in two volumes by Springer Verlag in 1990 (ISBN 0-387-97216-1), volume 9 in the "Sources in the history of mathematics and physical sciences" series. The edition was produced by G. J. Toomer and provided with an English translation and various commentaries. Apollonius of Perga's Conica: Text, Context, Subtext. By Michael N. Fried and Sabetai Unguru (Brill). Edmund Halley's Reconstruction of the Lost Book of Apollonius' Conics. By Michael N. Fried (ISBN 1461401453). ↑ Boyer, Carl B. (1991). "Apollonius of Perga". A History of Mathematics (Second ed.). John Wiley & Sons, Inc. pp. 156–157. ISBN 0-471-54397-7. The method of Apollonius in the Conics in many respects are so similar to the modern approach that his work sometimes is judged to be an analytic geometry anticipating that of Descartes by 1800 years. The application of references lines in general, and of a diameter and a tangent at its extremity in particular, is, of course, not essentially different from the use of a coordinate frame, whether rectangular or, more generally, oblique. Distances measured along the diameter from the point of tangency are the abscissas, and segments parallel to the tangent and intercepted between the axis and the curve are the ordinates. The Apollonian relationship between these abscissas and the corresponding ordinates are nothing more nor less than rhetorical forms of the equations of the curves. However, Greek geometric algebra did not provide for negative magnitudes; moreover, the coordinate system was in every case superimposed a posteriori upon a given curve in order to study its properties. There appear to be no cases in ancient geometry in which a coordinate frame of reference was laid down a priori for purposes of graphical representation of an equation or relationship, whether symbolically or rhetorically expressed. Of Greek geometry we may say that equations are determined by curves, but not that curves are determined by equations. Coordinates, variables, and equations were subsidiary notions derived from a specific geometric situation; [...] That Apollonius, the greatest geometer of antiquity, failed to develop analytic geometry, was probably the result of a poverty of curves rather than of thought. General methods are not necessary when problems concern always one of a limited number of particular cases. ↑ Dana Mackenzie. "A Tisket, a Tasket, an Apollonian Gasket". American Scientist. 98, January–February 2010 (1): 10–14. ↑ Boyer, Carl B. (1991). "Apollonius of Perga". A History of Mathematics (Second ed.). John Wiley & Sons, Inc. p. 142. ISBN 0-471-54397-7. The Apollonian treatise On Determinate Section dealt with what might be called an analytic geometry of one dimension. It considered the following general problem, using the typical Greek algebraic analysis in geometric form: Given four points A, B, C, D on a straight line, determine a fifth point P on it such that the rectangle on AP and CP is in a given ratio to the rectangle on BP and DP. Here, too, the problem reduces easily to the solution of a quadratic; and, as in other cases, Apollonius treated the question exhaustively, including the limits of possibility and the number of solutions. 1 2 3 Chisholm, Hugh, ed. (1911). "Apollonius of Perga". Encyclopædia Britannica (11th ed.). Cambridge University Press. Zeuthen, H. G. (1886). Die Lehre von den Kegelschnitten im Altertum. Copenhagen: Höst and Sohn. This article incorporates text from a publication now in the public domain: Heath, T. L. (1911). "Apollonius of Perga". In Chisholm, Hugh. Encyclopædia Britannica (11th ed.). Cambridge University Press. Wikimedia Commons has media related to Apollonius of Perga.